Next morning we head off by road towards Chiang Rai. We took a break at the Hot Springs, where the steam & hot water from the volcanic activity underneath is hot enough to boil eggs. Later we arrived at the boat pier to take a long tail boat for about an hour on the Mea Kok River towards Chiang Rai. More hotel inspections today in Chiang Rai starting with the Legend Hotel. This lovely deluxe hotel is built on the bank of the Mae Kok River. The beautiful swimming pool overlooks the river on one side & the hotel's tropical gardens on the other. This is a place to relax after your tour. The accommodation is decorated in Lanna style. If you choose one of the ‘pool villas’ there is a private Jacuzzi outside your room with view of the river. For a 'superior' hotel we are offering the 4* Dusit Island Resort, located on its own island in the Kok River, and having wonderful views from the restaurant and pool. The 3* Wiang Inn hotel is our final choice. This hotel has an excellent location in town just a few minutes stoll to the nightly market & restaurants. It also has a swimming pool & good size rooms. Next morning we drove to the area known as the 'Golden Triangle', calling on the way at Doi Tung where the Princess Mother Commemorative Hall, Mae Fah Luang Garden & Doi Tung Royal Villa are a popular destination for Thai visitors. The museum & the Royal Villa tell of the royal journey for a remarkable Thai lady. 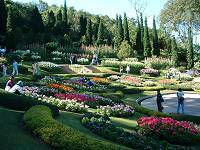 The garden is a beautiful landscape of flowers & plants. On the way down we stopped at an Akha hill tribe village, the street lined with stalls selling their home-made craft products. 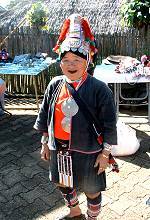 I brought a wonderful shoulder bag decorated with silver metal & colourful materials made by an Akha woman. She was very happy with my purchase. We drove onward to the Golden Triangle & visited the fantastic 5* Anantara Resort & Spa. In a superb location, this hotel has views of the Mae Khong (Mekong) River, with both Laos and Myanmar in view making the famous Golden Triangle where three countries meet. The rooms are beautifully designed & furnished in Lanna style. Opposite is the Opium Museum, a fascinating visit. After lunch at the Sri Wan Riverside restaurant, with spicy thai dishes and lots of Singha Beer we drove to Chiang Siang to visit Wat Chedi Luang, and on the way back called in at the Union of Hill tribe Villages. Here, seven different hill tribes live, exhibiting their life style and craft work. They are Akha, Hmong, Lisu, Lahu, Palong, Yao & Karen, the last being well known as the 'long neck' women. Next morning we left Chiang Rai at 5:45 for the 2 hour drive to Chiang Khong to start our boat journey to Luang Prabang, Laos. 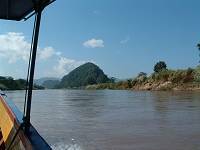 We arrived before eight, checked through Thai immigration quickly & boarded a small boat across the river to the Laos side. It was quite short work to complete the immigration procedures for Laos, so we had a look round town and a coffee whilst we waited for the remaining passengers to complete immigration formalities. 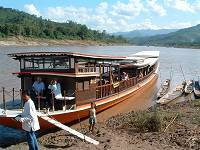 The Luang Say cruise boat is quite large, accommodating about forty passengers with several seating areas & a bar, toilet & kitchen. With the luggage stowed below decks we set off at about 9 o’clock and the lovely scenery of Mekong River life began to roll past peacefully. People began to mingle over free coffee and tea, and although the sun was bright, there was a cool breeze making most people reach for their jackets and sweaters. The boat stopped to visit a village before a buffet lunch was served on board.